You are currently browsing the tag archive for the ‘fraser towers’ tag. Numerous signboards have been put up along Jalan 5/60, numbering the parcels of land, the land size and telephone contact number. There appears to be at least 91 parcels up for sale. 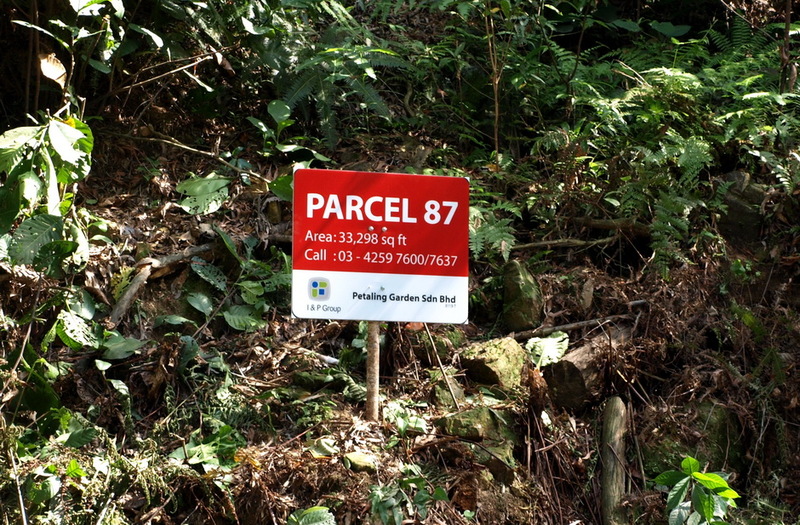 These parcels have been neatly subdivided on PJ side of Bukit Gasing. The land is very steep – over 45% slope. There were several landslides on this hillslope over the past few years. Jalan 5/60 is the only way in and out for Fraser Towers Condominium which is located at the end of this road. 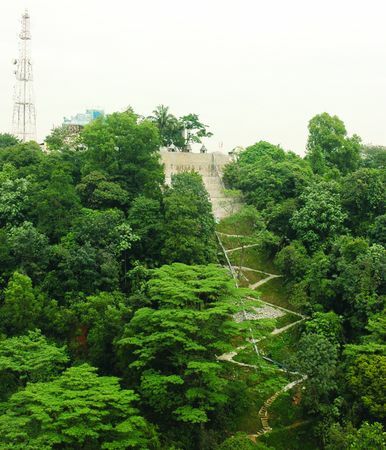 There will be little or nothing left of Bukit Gasing as a green lung and forest reserve if this development is allowed by MBPJ & the Selangor State Government….Save Bukit Gasing! I&P Group Sdn. Berhad is a wholly-owned subsidiary of Permodalan Nasional Berhad (PNB); and was formed in May 2009 after the successful merger and rationalisation exercise between 3 companies i.e. Island & Peninsular Sdn. Berhad, Petaling Garden Sdn. Bhd. and Pelangi Sdn. Bhd. 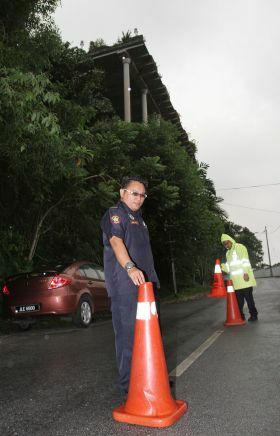 THE Petaling Jaya City Council (MBPJ) is conducting stabilisation and erosion control works on Bukit Gasing’s Sivan Temple site, with work going at a frantic pace due to the wet weather.Councillor Derek Fernandez said there is another 30% more to go on the hill covering Sections 6, 7 and 8. At a progress meeting on Nov 4, the Public Works Institute (Ikram) certified that more than half of the foundation repairs had been done on the said sections. “At Sections 1, 2 and 3 Caisson and hand-dug piles are being carried out. Only 10% has been done so far,” said Fernandez. He added that works on the hill also covers Sections 6, 7 and 8. Caisson and hand-dug piles involve personnel digging an eight-foot deep space before they place reinforcement tube into the ground and then filling it with concrete. Fernandez said rectification works had been delayed for a while and there was hardly any progress until an ultimatum was issued at a previous meeting between the council and the temple authorities. “The state government has been willing to alienate the land for the temple and the residents were in support of this but only on condition that procedures were properly followed,” he said. 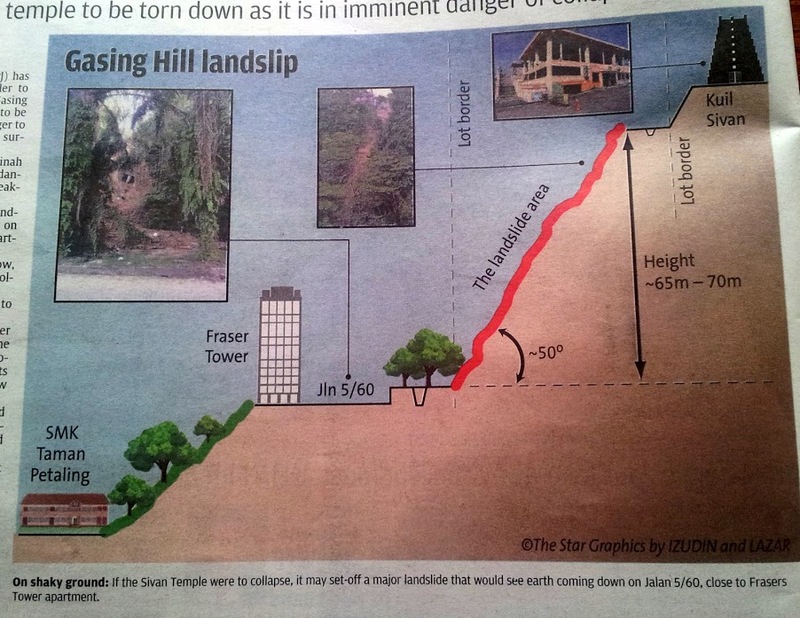 In August, Fernandez said the temple was asked to fund Ikram’s investigations into Sections 1, 2 and 3 of the slope. “The necessary funds (from the temple) were pulled in so Ikram could extend its investigations into land stability and stabilisation methods in Sections 1, 2 and 3 of the development,” he said. Ikram’s recommendations and instructions for soil rectification works are being carried out. 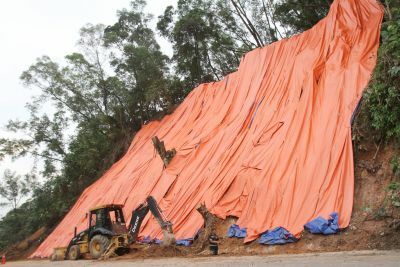 Fernandez said the stop-work order, issued in October 2008, still stands but slope repair and stabilisation works are allowed. 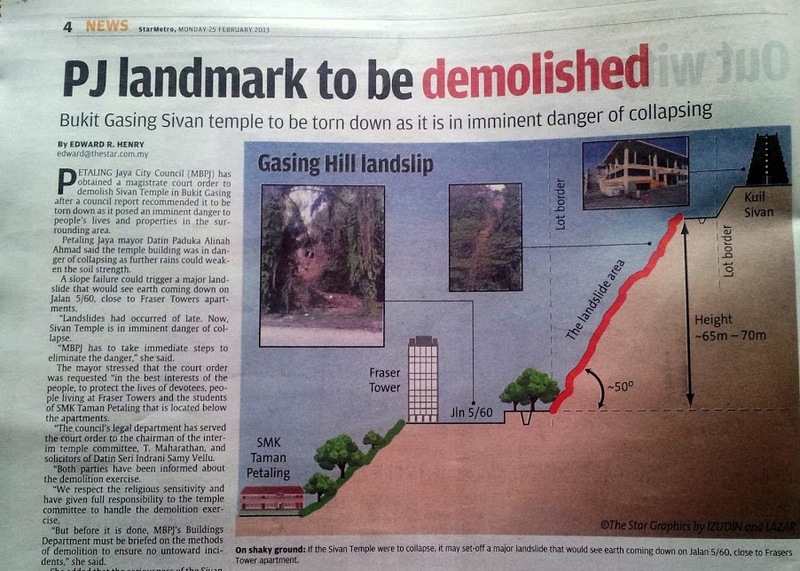 Earlier this year, Ikram found that the Sivan Temple development was a risk to public safety. Repair works started in August. The 40-year-old temple was first thrown into the limelight after a landslide in March 2007. The site where renovation works were being carried out was being transformed into a larger temple complex compared to the shrine and moderate temple that it was. What was originally planned to be a temple occupying a space of 1,400 sq m turned into a 5,700 sq m space for the three-storey complex made to accommodate 8,000 people, amid the building’s other attractions. MBPJ issued a stop-work on March 22, 2007, directing the demolition of the extended part of the construction but the order was ignored. On Oct 18 last year, MBPJ issued yet another stop-work order on the renovation and extension work after councillors Fernandez and A. Thiruvenggadam voiced their concern about public safety and the development. Questions on the land ownership arose and it was revealed that the land belongs to the state government. Subsequently, MBPJ and the state government – particularly Health, Estate Workers, Poverty and Caring Government exco Dr A. Xavier Jeyakumar, who is also part of the state’s three-man committee for non-Muslim religious affairs – have been working together closely to resolve the issue.